The report outlines nine criteria for successful Groundwater Sustainability Agencies. 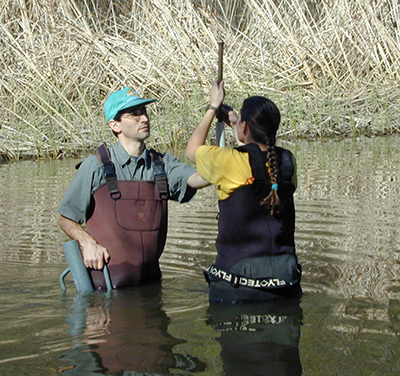 Andrew Fisher (left) has been studying the interactions between surface water and groundwater in the Pajaro Valley for 20 years. California has not managed or regulated groundwater use on a statewide basis for most of its history, and many of the state's aquifers have been depleted by overpumping. A team of experts led by UC faculty has now published a report that describes a path forward for successful groundwater management. With the passage of the Sustainable Groundwater Management Act (SGMA) in 2014, local governments across the state will be establishing Groundwater Sustainability Agencies (GSAs) to implement a state policy of managing groundwater resources sustainably. SGMA, however, does not give any specific guidance for the design and structure of these new agencies. The new report, "Designing Effective Groundwater Sustainability Agencies," explains how nine critical factors will determine the success or failure of the Groundwater Sustainability Agencies. Coauthor Andrew Fisher, a professor of Earth and planetary sciences at UC Santa Cruz, is the UCSC campus lead for the UC Water Security and Sustainability Research Initiative. He worked on the report with colleagues in the initiative and at UC Berkeley, UC's Hastings College of Law, the Union of Concerned Scientists, University of Massachusetts Amherst, and University of Idaho. "California has been overpumping groundwater for decades, by millions of acre-feet per year, with aquifers supplying 30 to 40 percent of freshwater needs across the state," Fisher said. "In the Central Coast region, extending from Santa Cruz to Santa Barbara, we rely on groundwater for about 85 percent of our needs." The drought has made groundwater overdraft worse in many basins, leading to subsidence of the ground, collapse of aquifers, and (along the coast) seawater intrusion. "SGMA provides a once-in-a-lifetime opportunity to change how groundwater resources are managed and to put basins on a path towards water security," Fisher said. The challenge is that GSAs are being organized quickly, and many will have to show rapid progress in developing and implementing plans for basin management. According to the report, if the GSAs are not set up correctly, taking into account the needs and interests of diverse populations, the new agencies will not succeed. The report's lead author, Michael Kiparsky, is the UC Berkeley campus director for the UC Water initiative and director of the Wheeler Water Institute at Berkeley's Center for Law, Energy and the Environment. According to Kiparsky, SGMA is "the most significant water legislation to have come to California in decades," providing a "tremendous opportunity." But care must be taken to establish effective GSAs, he said. "It's more difficult to change an agency that has already been created and started to do its work than it is to try and create that agency with the right structure in the first place," Kiparsky said. 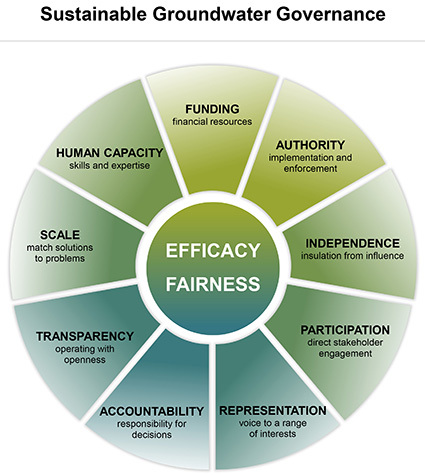 The new report describes linked criteria that support two main goals for effective groundwater management: efficacy and fairness. The nine criteria for successful GSAs include human capacity (having enough people with the right skills); reliable funding streams to support management and monitoring efforts; representation of diverse interests; transparency in decision making to build and maintain trust; and independence, with mechanisms to protect the agency from external pressures. "This region has been working for decades to meet requirements that are only now being imposed on other parts of the state," he said. "We are not part of big surface water transfer systems, so we have to make do with what we have."